NASHVILLE — Despite their power play struggles, the Predators found a way to take down their Central Division rival. 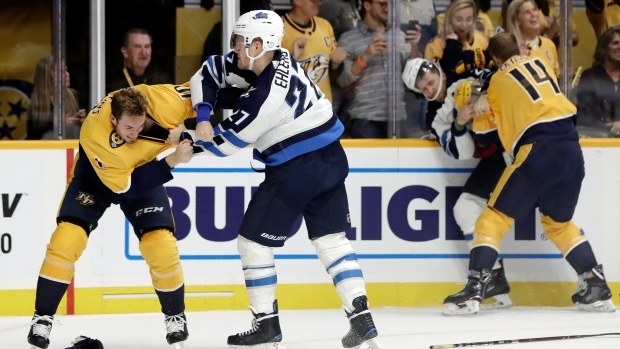 With the puck just inside the Nashville blue line, Jets defenceman Ben Chiarot sent an ill-advised cross-ice pass toward partner Dustin Byfuglien. Hartman stepped in front of the pass in stride and headed the other way. With a step on Byfuglien, Hartman shielded the big defenceman with his hip and beat Hellebuyck with a backhand on the stick side for the unassisted goal. "You get to work on your PK," Jets centre Mark Scheifele said of the prolonged time the team spent short-handed. "We did a good job. We made some big plays and Bucky made a lot of big saves."